Provide comfort for the family of Ruth Tanner with a meaningful gesture of sympathy. Ruth Mary Tanner, age 89 of Big Lots, passed away on April 1, 2019 at the South Shore Regional Hospital surrounded by her loving family. Born on October 10, 1929, Ruth was the 9th of 13 children to Pius and Elsie (Hubley) Dorey and was the last surviving. Ruth’s mother passed when she was five and her father passed when she was ten, creating a very strong, responsible and hard working person at a very young age. She loved the outdoors; worked as hard as any man, operated a chainsaw to cut logs to build a small barn and cut all of her own firewood. She worked in her woodlands keeping them neat, just like walking in a park. She could also change from her working clothes into a dress and dancing shoes to show her lady side. Ruth attended dance classes, loved to dance and was very graceful, a pleasure for others to watch. She spent her summers at the lake enjoying cottage life, eventually making it her home. She will also be remembered for her love of a good game of crib. Ruth spent many years donating her time to the Dawson Daisy. She started work at the old Dawson Memorial Hospital in Bridgewater at the age of fifteen. She then worked at the Fairview Hotel. Ruth also worked at National Sea Products (both old and new plants) until her retirement in 1990, when she was presented with a plaque of 28 years of service. Surviving is her son, Maxwell (Louise) Tanner, British Columbia; daughters Belinda (Kerry) Eisenhauer, Big Lots; Sharon (Clinton) Barkhouse, Rhodes Corner; grandsons Jody Barkhouse; James (Melissa) Barkhouse; Jonathon (Rebecca) Barkhouse; Steven (Allisa) Tanner; Great grandchildren, Maxwell Tanner, Daisy Tanner, Adain Dorey, Jazmin Barkhouse, Tristin Barkhouse, and Tyler Barkhouse. Besides her parents, Ruth was predeceased by her loving husband Robert in 1985; grandson Mark Tanner; seven sisters, Phyllis Tanner, Rita Whynot, Viola Zinck, Helen Eisnor, Lorraine Warren, Hazel Dorey and Margaret Dorey at birth; five brothers, Rex, Vincent, Douglas as well as Charles and Allen, both at birth. She was also predeceased by four nieces and two nephews. Funeral arrangements are under the direction of the Dana L. Sweeny Funeral Home, 11213 Hwy. # 3, Lunenburg, where a funeral service to celebrate Ruth’s life will be held on Monday, April 29, 2019 at 2:00 p.m.. She will be laid to rest next to her husband at Hillcrest Cemetery in Lunenburg. In lieu of flowers, memorial donations may be made to The Heart and Stroke Foundation of Nova Scotia, The Lung Association of Nova Scotia, or the charity of your choice. "Mom has gone to be with Dad"
To plant a memorial tree in honor of Ruth Mary Tanner , please visit our Heartfelt Sympathies Store. 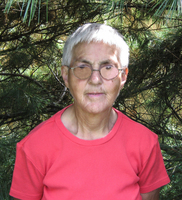 Ruth was a person that inspired me at a very young age, when I use to see her in the the woods cutting trees she made me feel like" I can do that" and I became one of the first women to take the forestry program at nscc. I remember sitting on the stumps and listening to her telling stories about her life experiences up at the camp just in awe of what she had built or her funny tales of all her mishaps.I think she was a little accident prone, but chin up she moved on.I will always remember her with the most greatest respect.My thoughts and prays are with the family.May her Spirit be Free. Lisa ,Stephen and Sarah. I met this lady several years ago. Her love on the outdoors was so amazing. This pint size person could fall a tree and cut it up at a blink of an eye. She loved to play tricks on me and told many stories about bringing up her family. As she grew older, as we all do, she was frustrated that she could no longer do the things that she once did. I want to thanks her family, Belinda, for inviting me into Ruth's home to meet her needs for blood tests. No visit was complete with out a huge hug and a wave and hug smile to my husband. Rest in peace sweet lady. I will miss you.